As the leading media company serving Hispanic America, Univision delivers the content Hispanics crave across a variety of mediums including TV, radio, web and mobile. Univision saw more than 100 million monthly pageviews coming from mobile devices, amounting to about one-third of their total web traffic. To bring the mobile user experience on par with their rich and comprehensive desktop website, Univision engaged Trilibis to revamp their large mobile web portal. 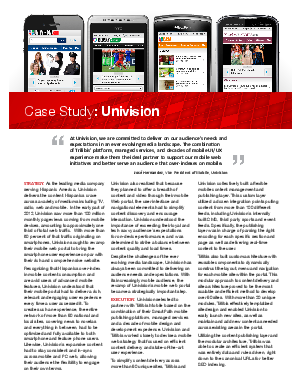 Trilibis worked closely with Univision's product team to devise a mobile strategy that focused on efficient content delivery and state-of-the-art user experience. To simplify content delivery from over 100 feeds and across 90+ unique sites, the two companies built a dedicated content management and publishing layer. Trilibis also built custom architecture with reusable components to dynamically construct layout, menu and navigation for each page. Usability features include broad use of swipeable image galleries, expanding and collapsing menus and personalized content options based on location. With its emphasis on content, performance, design and usability, the Univision mobile portal delivers a stellar user experience that's second to none. Other improvements include touch- friendly UI, improved performance, simplified content discovery and mobile SEO. Most recently, Trilibis implemented a range of social features including a comment system powered by Gigya and polls allowing for greater interactivity with Univision's content.